(Newser) – Americans in Iraq should be poised to leave at any minute—but not because of any terrorist threat. In a security alert, the US Embassy in Baghdad notes more than a million people could be drowned or left homeless if Iraq's largest hydro-electric dam on the Tigris River breaks apart near Mosul. The dam—built on a soft mineral easily eroded by water—has been impaired by structural flaws since it was built in 1984 and requires workers grouting around the clock to keep it strong, report the New York Times and Guardian. 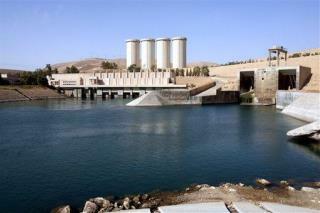 But when the Islamic State captured the dam for a two-week period in 2014, all work stopped. Few engineers returned when government forces recaptured it and regular maintenance couldn't continue. "It is going from bad to worse, and it is urgent," says a former engineer. "All we can do is hold our hearts." And how many trillions did we spend on this fiasco? Enough for thousands of health clinics for Americans.